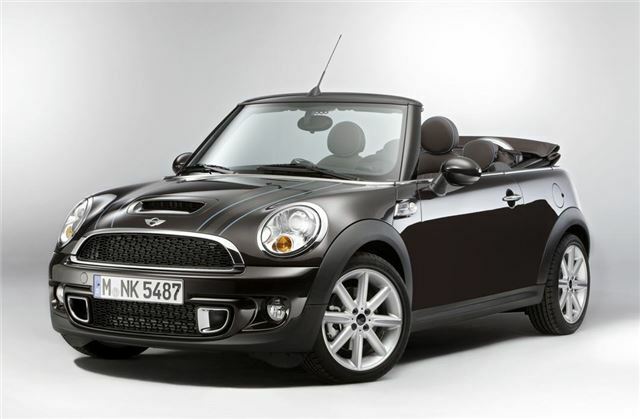 MINI has launched a new special edition model - the MINI Highgate Convertible. The name follows on from two special edition models from MINI last year - the Baker Street and the Bayswater. No sign of the MINI Old Kent Road yet though. The Highgate Convertible gets a new metallic paint colour called Iced Chocolate with a tailored 'Silvertouched Truffle' colour fabric roof. It also gets 'truffle' bonnet stripes with blue edging. Midnight Black metallic or White Silver metallic paintwork can be specified as an option while the door mirror caps are finished in the same shade as the exterior. Also unique to the MINI Highgate are 17-inch ‘Double Cross Turned’ light-alloy wheels in an aluminium colour. Apparently the design team took its inspiration for the spokes from the Union Jack flag. The brown theme continues inside with Dark Truffle Lounge Leather seats that have blue piping and contrasting stitching. The popular Chili Pack that includes automatic air conditioning, Bluetooth and USB connectivity, a multi-function steering wheel plus multi-coloured interior lights, is standard. The interior also gets Sun-touched Brushed Alloy detailing on the dashboard and the Chrome Line Interior and Exterior packages. Exclusive ‘Highgate’ lettering on the side indicator surrounds, door sills and seat tags marks the car out. The MINI Highgate is available with four engines: the MINI Cooper 122PS, MINI Cooper S (184PS), MINI Cooper D (112PS) and MINI Cooper SD (143PS). All comes with a six-speed manual gearbox as standard, while a six-speed automatic is available as an option.